CleanMail is the first anti-spam & anti-virus filter, that was designed from the beginning to provide complete email security - protecting you from spam and all kinds of email-borne malware like viruses and phishing mails - while at the same time making installation and usage as easy as possible. No more spam and viruses - just clean mail! Award-winning SpamAssassin engine: CleanMail combines today's most effective and advanced anti-spam technologies into one powerful solution. It comes with the full range of different antispam filters, including the award-winning SpamAssassin™ engine and a built-in spam trap to automatically keep the spam filter up-to-date by training a Bayes database with incoming spam mails. Anti-Virus: CleanMail integrates the Clam Anti-Virus package and additionally supports all popular virus checkers to protect you against all kinds of email-borne virus attacks. Attachment Filter: CleanMail's built-in attachment filter effectively blocks all kinds of potentially malicious email attachments. It is pre-configured to reject all attachment types known as potential virus vectors. DNS Blacklist (DNSBL) Filter: CleanMail checks IP addresses of incoming emails against DNS blacklists containing known spam relay hosts. The DNSBL filter rejects all mail that has been relayed by a blacklisted host. Shared Fingerprint Filter: CleanMail's Fingerprint filter calculates message fingerprints (fuzzy hashes) and compares them against a database of known spam message fingerprints. If a message fingerprint matches a known spam message fingerprint, the mail is blocked. If a message is blocked by another filter, its fingerprints are automatically added to the database, speeding up the processing of similar spam messages. 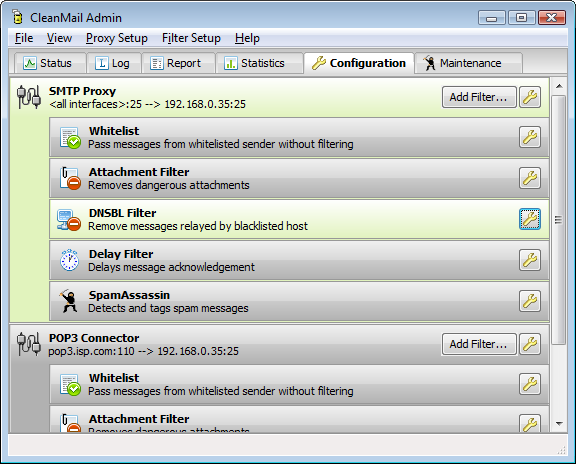 Delay Filter: CleanMail Server can be configured to use a built-in delay filter to stop spammers from delivering junk mails to your server. Tests have shown that the Delay Filter itself already blocks up to 73% of all junk mails while causing only minimal resource usage on the host system. The effect of delay filtering is comparable to greylisting, but delay filtering of course avoids the common drawbacks of greylisting. SMTP Traffic Limiting, Protection against Directory Harvesting and Mail Flooding: CleanMail Server additionally implements very effective algorithms to protect your Mail Server against Directory Harvesting, SMTP AUTH attacks and Mail Flooding. 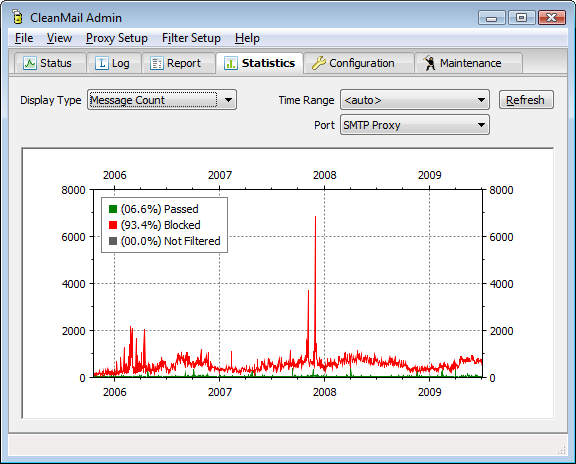 POP3-to-SMTP Connector: CleanMail Server has a built-in POP3 Connector to retrieve messages from a POP3 server, and forward these messages (after filtering) to a mail account on your SMTP server. Web Dashboard: With the Web Dashboard, administrators and end users can easily access current status information and quarantined emails. Read more about CleanMail's Email Security Features. CleanMail Server is suitable if you are looking for a server-based antispam & antivirus solution to protect SMTP or POP3 servers. Its flexible architecture makes it very easy to integrate CleanMail Email Security into any existing infrastructure. CleanMail is the perfect email security and antispam filter for all versions of Microsoft Exchange, Lotus Notes/Domino, IMail or any other mail server software. Available for all Windows versions and Linux/i386. Supports all versions of Microsoft Exchange and Windows Small Business Server (SBS). CleanMail Hosted Email Security - complete Email Security (Anti-Spam, Anti-Virus, Anti-Phishing) without the need to install or maintain anything yourself - we manage everything for you. Works with any existing mail server (Microsoft Exchange, Lotus Notes/Domino, IMail etc.) and all platforms. CleanMail Home protects a single computer against spam email. It can be used with any POP3 email client software, such as Microsoft™ Outlook and Outlook Express™. Available for all Windows versions. To learn more about the differences between the Server and Home editions, please have a look at the CleanMail feature matrix. It is of vital importance to keep your email security up-to-date. Our Free Email Security Check is intended to help you with this task. Download the free trial and get rid of spam and viruses in just 5 minutes. "We've made the switch from Clearswift Mailsweeper to CleanMail and we couldn't be any happier. CleanMail was simple to install and is very easy to administer. We spend less time working on spam filters/rules and more time with our customer projects. Thats a huge win for us and our customers." The trial is fully functional for 30 days and we provide full support during the trial period - if you have any questions, please feel free to contact our support team.